Sherlock Series 4 is premiered on 1 January 2017 and its DVD will be soon released on 24 January 2017. This is a tutorial for all Sherlock Holmes fans to rip DVD Sherlock British TV series, including ripping DVD Sherlock Season 4 and copying DVD Sherlock Season 3/2/1. Crazy about Benedict Cumberbatch Sherlock Holmes? Look over here! It's after 2am and I have just registered on IMDb after watching the first episode of Sherlock. If they had an 11 out of 10 rating... that's my vote. You may be inundated with amounts of information of Sherlock these days, a hot British crime drama winning the top spot of TV series. Awarded numerous awards like Best Drama Series, YouTube Audience Award etc., this modernized version of the greatest fictional detective Sherlock Holmes make the whole world a big fan of Benedict Cumberbatch Sherlock Holmes. Most of you buy DVD Sherlock for collection or enjoyment time and time again. However, to freely enjoy DVD Sherlock ANYWHERE anytime, you need to rip DVD Sherlock and copy Sherlock Season 4, Sherlock Season 3/2/1 to your iPhone, iPad, iPod, Android, Samsung, HTC etc. To rip DVD Sherlock Season 4 and copy DVD Sherlock Season 3/2/1, choose a handy ripping tool for yourself. WinX DVD Ripper Platinum is suggested here, which provides solution of fast TV shows DVD ripping, helping you rip DVD Sherlock easily. Free download WinX DVD Ripper Platinum here and install it on your PC. It works well on Windows 10/8/8.1/7, etc.. If you are Mac users, click to try our Mac version. Put your DVD Sherlock into the DVD drive. Click "DVD Disc" on the main interface to load the content of this TV series. We take Sherlock Season 4 DVD ripping as an example here. Note: British TV series is mostly as short as 3 episodes per season, just like Sherlock Season 4 and Sherlock Season 3. You can rip DVD Sherlock of 3 episodes into 1 for your convenience of watching. Just tick the option "Merge titles". Select a proper output format based on your need. WinX DVD Ripper Platinum supports a wide range of output formats and provides you various presets. 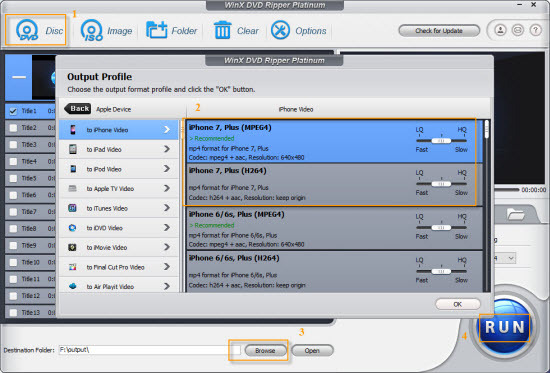 You can rip your DVD Sherlock to iPhone, iPad, iPod, HTC, Samsung etc. Refer to how to rip DVD to iPhone 7/6S, DVD to Android, DVD to iPad Air 2/3 etc. Suppose you need to rip Sherlock Season 4 DVD to iPhone 7 now and set as below. Choose an output folder and click the button "RUN" to start copying DVD Sherlock on PC/Mac. WinX DVD Ripper Platinum is well-known for its fast ripping process. On top of that, it is also a powerful DVD backup program, which can bypass all region code and copy protections, enabling you to rip protected DVDs to AVI, MP4, MOV, iPhone, iPad, Android etc. If you need an editing tool to customize your output video of Sherlock Holmes, then WinX DVD Ripper Platinum is right for you to easily remove the unwanted borders and you can set a start and end time to rip the only part you want of DVD Sherlock. Try this Best DVD Sherlock Ripper and enjoy adventures of Sherlock Holmes and Watson. Rip and Copy Inside Out DVD: How to Rip and Copy Inside Out DVD to MP4, AVI, MOV and More? Sherlock Holmes (TV series) - A British television crime drama that presents a contemporary adaptation of Sir Arthur Conan Doyle's Sherlock Holmes detective stories. it stars Benedict Cumberbatch as Sherlock Holmes and Martin Freeman as Doctor John Watson.